Coach Hanrahan began his coaching tenure at UF in 2016. Before that, he was an assistant coach and defensive coordinator at Merritt Island High School. Prior to becoming a coach, Hanrahan enjoyed a 13 year playing career dating back to his youth in Virginia. He played midfield for the Gators for 4 years and captained the team during his senior season. Coach Hanrahan graduated from UF in 2015 with a B.S. in Mechanical Engineering. Through Coach Hanrahan's first two seasons at the helm, UF Lacrosse has a combined regular season record of 21-6. In 2018, they returned to the ranks of the MCLA National Top 25 for the first time since 2011, climbing as high as #23. As a result of the team's effort and success, Coach Hanrahan was selected as the UF RecSports Coach of the Year for 2017-2018. Coach Rayburn has been coaching youth sports at all levels for over 20 years and has been coaching lacrosse for over 10 years. He joined the UF staff in 2016 and also serves as defensive coordinator at Eastside High School in Gainesville. 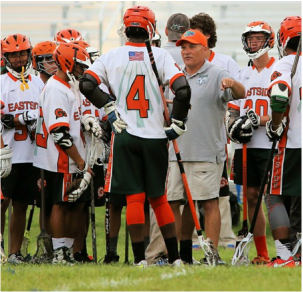 Before that, Coach Rayburn enjoyed a tenure coaching lacrosse at West Springfield High School in Springfield, VA.
Coach Rayburn is a 1985 UF graduate with a degree in Criminal Justice. He earned a commission in the United States Army through the UF ROTC program and spent over 26 years on active duty, primarily as an Operations and Training Officer. He retired with the rank of Lieutenant Colonel. ​Coach Rayburn is a veteran of Operation Desert Storm and Operation Iraqi Freedom. Coach Adams played at Gainesville’s Buchholz High School and has been instrumental in growing the game within Alachua County and the surrounding area. Adams has been on the lacrosse staff at Buchholz since his graduation in 2010, and he has been the head man there since 2015. In his 3 seasons at the helm, Buchholz has amassed a 31-17 record highlighted by the program’s first-ever district championship in 2017 when they upset north Florida powerhouse Oak Hall to win the FL-District 3 title. That achievement earned Adams the Gainesville Sun’s Coach of the Year award for 2017. ​Coach Adams joined the UF staff in the fall of 2018 and brings proven success as a coach, a passion for the sport, and a high lacrosse IQ to his new position. He will be a valuable asset for our players as we take the next step toward becoming MCLA National Champions.